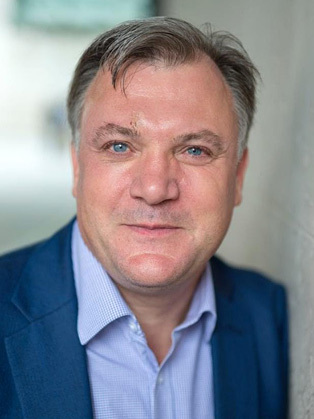 Ed Balls was UK Shadow Chancellor from 2011 to 2015 and co-chaired the Center for American Progress Inclusive Prosperity Commission with former US Treasury Secretary, Larry Summers, which reported in January 2015. He served as a member of the Prime Minister’s Holocaust Commission and is now a member of the Holocaust Memorial Foundation Board. Ed served in the British Cabinet as Education Secretary (2007-2010). He was previously the UK Minister for Financial Services (2006-2007) and the Chief Economic Adviser to the UK Treasury (1997-2004), during which time he was the Chair of the IMFC Deputies and UK G20 Deputy. As Chief Economic Adviser to the Treasury (1997-2004), Ed led the design of policies including independence of the Bank of England, the New Deal jobs programme, the Five Tests Euro assessment, Sure Start, tax credits and the national minimum wage. As a Treasury Minister, he was commissioned by the G7 Finance Ministers to prepare a report with Sir Jon Cunliffe (now deputy Governor of the Bank of England) on Economic Aspects of the Israel-Palestine conflict. At the Department for Children, Schools and Families, Ed brought together schools and children’s policy for the first time in the Children’s Plan and pushed through radical and progressive policies including raising the education and training age to 18, reform of the social work profession, establishing the support staff negotiating body and extra investment in youth services and short breaks for disabled children and their families. As Shadow Chancellor, Ed was awarded the Spectator Parliamentarian of the Year and the Political Studies Association Politician of the Year. Ed is Vice President of Action for Stammering Children, a Patron of the British Stammering Association and a Patron of Whizz-Kidz. He has run the London Marathon three times since 2011, raising over £160,000 for WhizzKidz and Action for Stammering Children. He is a member of the Privy Council and an Honorary Fellow of Keble College, Oxford. Ed also took part in Strictly Come Dancing in 2016.